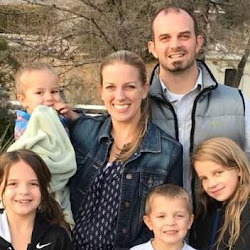 With my daughters getting bigger, I have found that I have to be even more intentional about our preschool and kindergarten aged boys having adequate and purposeful learning time. I can easily dive into the higher math and language lessons my girls need, and totally forget that Levi has been very curious about learning his numbers. Fortunately, we have a good foundation of play activities, toys, games, and more that we have used for all our children and are still in great shape for our boys. We do not stick to one particular style of study, but I do have a love for Montessori learning (and a general hatred for cheap plastic crap). So Melissa & Doug products generally make me really happy. Plus, many of these items that were purchased earlier on have lasted through all four children. Others are newer additions to our home and are finding an enormous amount of use from both boys. 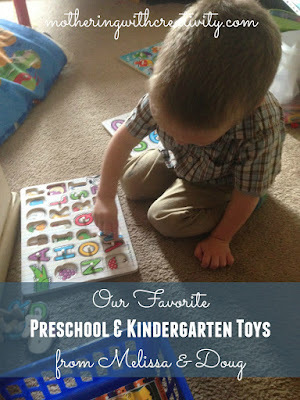 I wanted to share some of our favorite Melissa & Doug products (and why we love them) with you! 1. Puzzles. Our oldest and most loved Melissa & Doug products are our puzzles. We purchased or received as gifts many of these when our girls were little. We have a variety of them- the alphabet, animals, numbers, and colors. 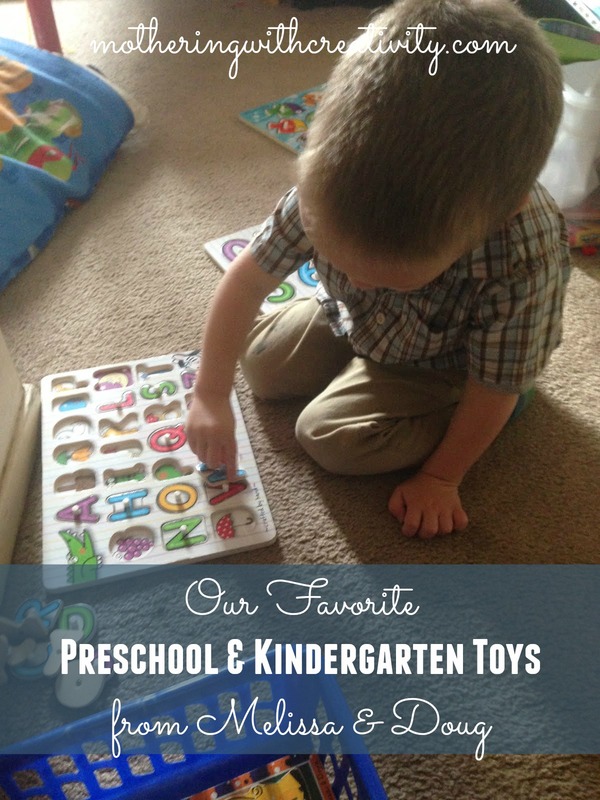 All of these focus on matching, fine motor skill development, and letter/number/color/animal recognition. The letters puzzle also works on letter-sound recognition, as each letter has a picture underneath. When the kids get a little older, they'll use the letter puzzle pieces to spell words, or the number pieces to create larger numbers ("can you build me the number fifty-two?"). 2. Clock puzzle. Another puzzle we love is also used for math! This cute clock not only has a variety of shapes and colors for the numbers of the clock, but it has labeled minute and hour hands, as well as minutes by the 5's written on the inside, too. While my little 3 year old moves the hands to match up with the number he's currently placing, my 5 year old will match the hands up to particular times that I ask him to show me. 3. Toy car parking garage. I bought this for my 3 year old this past Christmas and he absolutely LOVES it. He already loved cars, but this has so much more for him. He loves matching up the cars to their proper color, and then running his finger along the numbers and saying each one. Or, he'll even count backwards from 10 using the numbers as a guide. He really enjoys watching the cars fall down the ladder as he pulls one out from the bottom, too. 4. Pizza Kit. We all know young children love imitating real life. My 5 year old really enjoys creating pizzas and serving his customers. He'll often walk around the house asking for your order. I love how he is practicing his question-asking skills, as well as his listening skills as he prepares the correct types of pizza slices for his customers. 5. Car and Truck Carrier. My littlest just loves all things that "go." This car and truck carrier is another perfect toy for imaginative play and fine motor skill development. This has been a well-loved toy by Levi for the past year. Basically, Melissa and Doug products are super awesome. I love them. I love that they're made from wood and totally aren't crap. These are just some of our favorite products from M&D that help in our homeschool, but really, you can't go wrong with ANY of their products. Do you have a favorite Melissa & Doug product that you use in your home for intentional learning? What are your favorites?